Part two of my ‘Puppet King Saga’ continues today…. the two ‘greatest friends’ of the people of Palestine met today to discuss the future of the Palestinians. 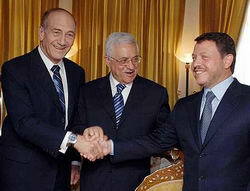 Puppet King Abdulla had a ‘surprise’ visit from Olmert this morning… we are all really surprised at his eagerness to establish peace in the region…. Abdullah wants Israel to resume peace negotiations with the Palestinians….. Yesterday he made it very clear that he will support Abbas, Olmert made it very clear he will never negotiate with Hamas…. just who are these peace negotiations going to be between? Will be interesting to see agreements signed by people not representing anyone but themselves, that’s what I predict Abbas will be doing if he is successful in getting the elections he called for. Should be an interesting next few weeks…. to say the least. Following is an Associated Press report on this…. Prime Minister Ehud Olmert made a surprise visit to Jordan Tuesday for talks with King Abdullah II on ways to revive Mideast peacemaking. A senior royal palace official said Olmert’s visit came in response to an invitation by Abdullah, who is eager to see Israel resume peace negotiations with the Palestinians. The Prime Minister’s Office confirmed the visit. “In the meeting the two leaders discussed bilateral issues and developments in the Palestinian Authority as well as the wider regional situation,” it said in a statement. Olmert’s visit came hours after Abdullah said in a written statement that he will soon make a rare public contact with Israeli leaders in a bid to revive stalled Mideast peacemaking. The statement released by the royal palace Monday night did not explain if the king planned to host Israeli leaders or visit the neighboring country, with whom Jordan signed a peace treaty in 1994. The king hosted Olmert and Palestinian Authority Chairman Mahmoud Abbas in June in an effort to get both leaders to open direct negotiations, but the effort failed. Abdullah has said a return to Arab-Israeli peace negotiations is vital to curb rising extremism in the Middle East, fueled by the conflict in Iraq. The monarch has called on Washington to concentrate more on reviving the peace process, which is stalled amid a Palestinian leadership crisis.